The Oils-Energy group has plenty of great stocks, but investors should always be looking for companies that are outperforming their peers. Is Viper Energy Partners (VNOM) one of those stocks right now? By taking a look at the stock's year-to-date performance in comparison to its Oils-Energy peers, we might be able to answer that question. Viper Energy Partners is a member of the Oils-Energy sector. 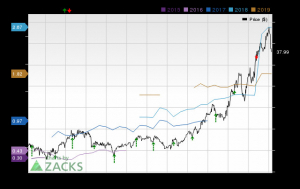 This group includes 331 individual stocks and currently holds a Zacks Sector Rank of #6. The Zacks Sector Rank considers 16 different groups, measuring the average Zacks Rank of the individual stocks within the sector to gauge the strength of each group. The Zacks Rank emphasizes earnings estimates and estimate revisions to find stocks with improving earnings outlooks. This system has a long record of success, and these stocks tend to be on track to beat the market over the next one to three months. VNOM is currently sporting a Zacks Rank of #2 (Buy). Within the past quarter, the Zacks Consensus Estimate for VNOM's full-year earnings has moved 13.19% higher. This is a sign of improving analyst sentiment and a positive earnings outlook trend. According to our latest data, VNOM has moved about 66.57% on a year-to-date basis. Meanwhile, the Oils-Energy sector has returned an average of 4.82% on a year-to-date basis. This means that Viper Energy Partners is outperforming the sector as a whole this year. Breaking things down more, VNOM is a member of the Oil and Gas - Exploration and Production - United States industry, which includes 79 individual companies and currently sits at #106 in the Zacks Industry Rank. On average, this group has gained an average of 1.02% so far this year, meaning that VNOM is performing better in terms of year-to-date returns. VNOM will likely be looking to continue its solid performance, so investors interested Oils-Energy stocks should continue to pay close attention to the company.